Hello and welcome to the first Healthcare Improvement Scotland blog. 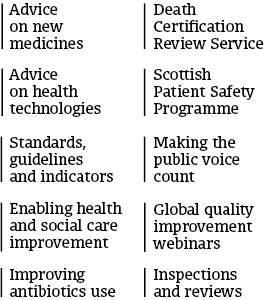 We want to highlight some of the really amazing work going on improving health and social care across Scotland, let you know how we help and hopefully prompt some healthy debate. After retiring from my frontline healthcare job, I was anticipating a quiet life in the background. But I still felt the need to do something useful. So off came the slippers and I feel fortunate to have been appointed Chairman of Healthcare Improvement Scotland since its launch in April 2011. So why become involved again? Well, after a career spent looking after those with mental health problems, a huge motivation for me is improving Scotland’s mental health. That is linked to a firm belief that parity of esteem for physical and mental health – rightly promised by everyone – still isn’t the reality often enough and embedded in the care we provide. And even if we reach that goal, why not aim even higher? Why not put mental health first – particularly for our young people? Isn’t having a mentally healthy society the starting point for a healthier society, especially if we really want to tackle inequality and prevent physical ill health in Scotland? If we genuinely care about improving and prioritising mental health services I believe we should start with simple interventions that don’t cost extra money, but could, for example, improve the lives of our children. This is really crucial for children living with parents who have a mental health illness. It is estimated there are 175,000 young carers of parents with mental health illness in the UK. But that could be the tip of the iceberg as other studies reckon there are 1,000,000 children affected by a parent’s mental health. These children often go under the radar because they can be quiet and withdrawn and do well at school. They feel lonely, isolated, sometimes blame themselves for a parent’s illness and hide their fears. They don’t understand what’s happening and they lack a credible explanation of events. There are no obvious warning signs that anything is wrong. Voluntary organisations like Barnardo’s do great work reaching out to these young people – but they don’t reach the threshold for social work intervention, so there is no safety net in place for them. With one ill parent they have – according to research – a 70% chance of adjustment difficulties. We can easily fix this in Scotland. There is good evidence that discussing a parent’s illness with a child can have a protective effect. Small, well timed interventions with a caring adult and befriending projects have demonstrated good outcomes. Alan Cooklin, a respected psychiatrist, has written extensively around the needs of children of parents with mental illnesses and developed a training resource ‘Being seen and heard’. It is aimed at all staff and family members engaging with children. The package is simple, it explains what is happening – tells the story – and helps children not only understand what is going on but can build resilience to coping with it. The Kids time workshops at UCL support this approach (I’ve included a link at the bottom of the blog, if you want to read more about both of these approaches). These children don’t need therapies; they need information, understanding and support. They don’t need the intervention of CAMHS specialist teams. Anyone can provide the package once they are trained and adult community health teams are ideally placed to do so as part of their service to the parent. This work has already started in Scotland and I want it to be embedded for the future and to support generations to come. We must not lose the progress we have made – and we need to build on it. Early intervention teams that help young adults in the first stages of their illness are starting to trial this work. They need the support of Integrated Joint Board commissioners who now have the responsibility for community mental health services. Children can overcome adversity if they know what is happening to them and why. Let’s put the mental health of our children first in Scotland and let them thrive.